"And I am rather good ... " The truth is here, hidden within. Everyone has opinions and most are able to offer them as such, but those who claim fact when it is merely conjecture, generally don't impress. Of course they still think they do and that's OK, we all have a self image and ego. Thankfully we live in a region where there is free expression whether correct or incorrect. I can choose to pay attention or ignore. Imagine, if we all assume our voices are never heard we'd never vote; and that would be a shame. Canon provides a percentage battery use and the number of shots fired on that battery since charge. This is available in the menu and can be added to the quick menu so it is easily accessible. I'm quite happy with the indicator on the top and with 700 + shots per charge this is absolutely not a problem. I can think of improvements to my gear, but this is not one of them. well, not in my experience. I find the %-battery meter on our iPhones to be quite good and highly appreciated functionally. It works down to the last % before the phone really conks out. And I can safely operate it down to 10% without having to worry at all immediate power loss. If my Canon cameras had a similarly good battery meter I would be already happy. But, no, thanks to "innovative" Canon and its marketing nerfing. 4-segments! 6-segments! Give me a f*cking break, Canon! only in some cameras. Typically not in the 4-battery-segment ones. I know that one or more of my Canon cameras have more detailed battery information available but buried in a menu somewhere. If I need to know more than the segments tell me, I can ferret the info out. I so very rarely shoot all day with my DSLR that I generally don’t need to look, and I’ve definitely not checked to see whether this info can be put on the main screen in customized settings. I can see for me more use for checking this page display as the battery approaches EOL. I think that has been true on some models in some iOS versions. I can’t recall experiencing it myself. My phone warns me when it gets down to 10% and then 5%. I think the 5% level goes to zero pretty fast, though. My phone is about three years old, and the recharge efficiency is purported to be 87% now. I do plan to do the $29 replacement before it ends, and may keep the phone another three years. I don’t need to upgrade the phone for a better camera or more speed. No matter how fast the phone, I’m not going to talk any faster. % charge info hidden in menu system is a weak workaround, when that info should really be prominently displayed on rear display. And on status display on top, if camera has one. And - user switchable - also in EVF. Maybe future higher-end EOS R bodies will get a hi-rez version of a 6-segment battery charge meter. "canon-style" product differentiation. Mk. III versions may then be announced with "newly designed, 10-segment battery charge indicator". And Canon Defense Leaguers will rejoice. I can't understand why all the whinging about not having a joystick to move the focus points. The touch and drag focus on my M5 is fantastic to use. So fast and accurate and certainly much faster than using the joystick on my 5d3. To me, this is a real positive for the R. I wish my 5d3 has this feature. I reckon using the touch bar for ISO and the lens ring for exposure compensation will also make it very easy to use too. I'm really looking forward to trying one out. It's not unlike the complaints about the 6D selector that differed from the joystick format. I found it a little too small to be efficient but overall it did the job rather well. Of course anyone coming from a joystick format would not be happy ... mainly because it's different. A recent topic of discussion - do humans like or dislike change - we're all over the map on that topic. The reviews I have read this far are very promising for battery performance. Frankly, I hate how on some cameras, 25% battery versus 60% battery is a huge deal. On every LP6 battery Canon camera I've owned so far, it just isn't. When it gets really low, like 1 bar, swap or change it. If you're going for a really long day, take a spare. Otherwise, don't sweat it. I really don't want to have to care to what percent my battery is charged. I've used all three styles pretty extensively (joystick, dpad, and touch), and my favourite is the joystick. Touch works best on smaller camera bodies in my opinion, and everything but joystick(with a a second joystick on a grip) falls short if you do a lot of portrait orientation shots with a grip for obvious reasons. But for most purposes, I think any of the point selection methods can work quite well. I wish there were a way to program just a few favorite points and toggle between them with a thumb dial. I always carry a spare battery! But, I like to see a percent reading for a battery as I like numbers and they are useful. For example, you can quickly calculate how many shots per battery charge under different conditions from the percent remaining. The eadouts can be surprisingly accurate. I recently checked various chargers by plotting the increase in % charge vs time and the % rates were remarkably linear showing the readings were accurate. Us geeks like quantitation. Available in both my 5DsR and 6D and both have 4 sector indicators. Not a problem. Let's move on. I certainly "don't sweat it", also I would really prefer a "continuous bar" and a % number next to it. Battery charge indicator is just one prominent example, how Canon is marketing nerfing their products down the absolutely very last detail in their [old-style and futile] attempts to nickel and dime their customers even in areas where "marketing differentiation" of products is simply ridiculous. yes it is a problem. Not so much the gauge per se, but the "Canon spirit and corporate attitude" revealing itself by incorporating 1970s style readouts [when LCD panels could technically only display coarse 4 or 6 kernel segments] in late 2018 cameras ... the real problem sits in Canon and Nikons beancounting octagenarian boardroom. I would think with so many focus points a joystick would be pretty frustrating to use too. Touch and drag is the natural and sensible way to adjust your focus points. Once you start using it you won't ever think about joysticks again. 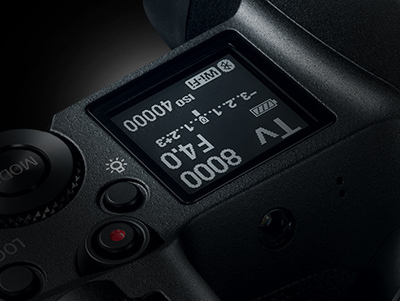 The joystick doesn't go one pixel at a time, though (with the exception of Sony A7/A9's "+" focus mode). They bump over one square at a time, and that suits me just fine. I am not as fond of touch and drag because my thumb doesn't naturally rest on the LCD, especially on heavier cameras with heavier lenses, and also because it doesn't work if you're using the camera gripped in portrait mode. Because there's no LCD there when the camera is rotated, I end up having two control paradigms to contend with at the same time. However, don't get me wrong; touch and drag is a fine system. It's cool, and I think that modern cameras should have it, since they pretty much all have touch screens that the thumb can access, at least in landscape orientation. I was a little confused by some of the discussion and my remark above may not have been clear. I tend not to look at the LCD display but have always gone to the Battery Info in the menu of my various 5Ds and 7Ds to read the % remaining. It's a nice Canon feature that tells you both how many shots you have taken with the battery and the % used and so you get a good feel for the battery life with different usage and how your individual batteries are holding up.